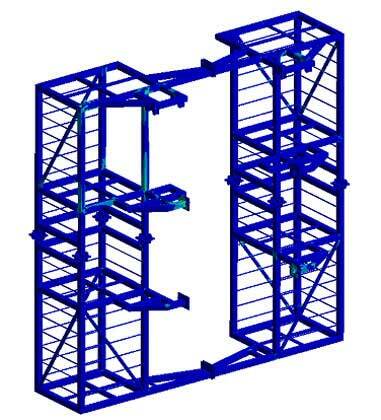 The design of offshore structures is arguably one of the most complicated tasks for engineers. Apart from withstanding land-based loading conditions, offshore structures also have to withstand hydrodynamic interaction effects arising due to its placement in ocean environment. Additionally, the effect of wind loads also impacts the overall strength of the structure. Hi-Tech assisted a leading offshore equipment manufacturer in developing the tower design, considering the effects of wind and hydrodynamic loads through computer aided analysis. A 3-dimensional finite element analysis was performed to evaluate the structural integrity of the tower system under given loading conditions. 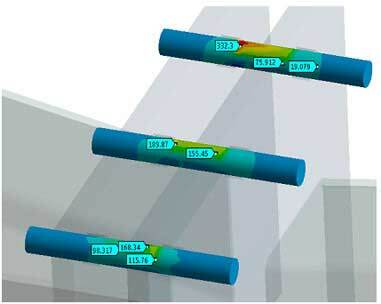 From the results of structural analysis load cases, reactions were obtained at the bracket supports and rail supports, which were further used to simulate for local analysis of rails and brackets. The results indicated that the structure is safe under the applied loading conditions with satisfactory Factor of Safety.